The inaugural season of Musical Ecologies concludes on Thursday June 13 with a solo performance by series creator and composer Dan Joseph. Continuing his exploration of the electroacoustic hammer dulcimer, Joseph will perform the latest iteration of his ongoing work Dulcimer Flight. With roots in early minimalism, ambient music and acoustic ecology, Dulcimer Flight is a long-form “journey” piece that combines composed elements, often in the form of a fixed melodic pattern, with extensive improvisation while exploring the dulcimer’s rich harmonic properties. The title is a reference to other “flight” pieces by Pauline Oliveros and Terry Riley, which help to inspire this one. Composed in Oakland (CA), it was first performed in Washington, DC and has since been heard in San Francisco, Berkeley, Philadelphia, Corvallis (OR), New York City and Kingston, NY. A pre-concert conversation with the composer will be hosted by composer/percussionist Danny Tunick and a reception will follow. Dan Joseph is a free-lance composer based in New York City. He began his career as a drummer in the vibrant punk scene of his native Washington, DC. During the late 1980s, he was active in the experimental tape music underground, producing ambient-industrial works for independent labels in the U.S. and abroad. He spent the ‘90s in California where he studied at CalArts and Mills College. His principal teachers include Pauline Oliveros, Alvin Curran, Mel Powell, and Terry Riley. 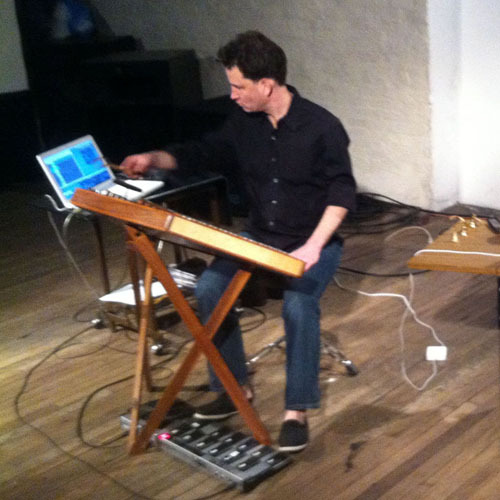 An artist who embraces the musical multiplicity of our time, Dan works simultaneously in a variety of media and contexts, including instrumental chamber music, free improvisation, and various forms of electronica and sound art. Since the late 1990s, the hammer dulcimer has been the primary vehicle for his music and he is active as a performer with his own chamber ensemble, the Dan Joseph Ensemble, as well as in various improvisational collaborations and as a soloist. Comments closed — Trackbacks closed RSS 2.0 feed for these comments This entry (permalink) was posted on Wednesday, May 22, 2013, at 10:22 am by Dan Joseph. Filed in uncategorized.